Coco Karol is a New York based dancer, teacher, and artist who makes cross-disciplinary performance work. She holds a BFA in Dance from Tisch School of the Arts and an MFA from Hollins University. 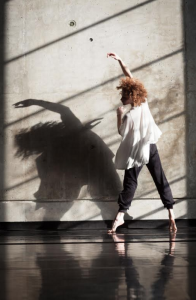 As a dancer, Karol has had the privilege of working for Misnomer Dance Theater, Cherylyn Lavagnino Dance Company, and Christopher Williams, as well as being a part of projects by Christy O’Harris, Bill Young, Jose Navas, and Steven Petronio. Karol has created work with musicians including Bjork, Ryan Lott (Son Lux), Koh Ohtera, Luna Cholong Kang, Daniel Carter, Minna Rhee Choi, and Ear to Mind collective; and visual artists including photographer Steven Sebring, sculptor Eve Laroche-Joubert (aka Bailey), architect Marcos Zotes, stereoscopic artist Gerald Marks, videographer Azmi Mert Erdem, and designer Louda Larrain. Her work has been shown internationally as well as across New York at Carnegie Hall, Symphony Space, BAX, Brooklyn Studios for Dance, Ibeam, Spectrum, D.U.M.B.O Under the Bridge Arts Festival, New York Studio Gallery, Galapagos, Death By Audio, and curated by AUNTS. She has taught movement workshops in San Francisco to musicians of the Magik*Magik Orchestra, in Istanbul about movement and social movement, and in Roanoke investigating non-verbal communication and gestures of care. Karol is a dedicated teacher of movement, yoga, and qi gong. Her work is informed by her studies and practice in improvisation, butoh, authentic movement, meditation, and the belief that we move to move, and to be moved. She founded Red Sole Productions, a small production company for dance-based media and movement installations.